So, that got me thinking, is a DSLR just a expensive piece of kit, that people have, just to show of? or is it an investment piece, that could last you for years to come. The answer, I believe is the person behind the camera. Of course, DSLR cameras are expensive. I'm not going to pretend that they aren't and brush it under the carpet. DSLR's can set you back quite a few hundred pounds, not to mention all the bump that shops try and sell you with it. I truly believe that a DSLR can be a really life changing piece of kit wouldn't go that far, but you get what I mean. What turns a DSLR from becoming an expensive piece of kit to an investment is what you do with it. 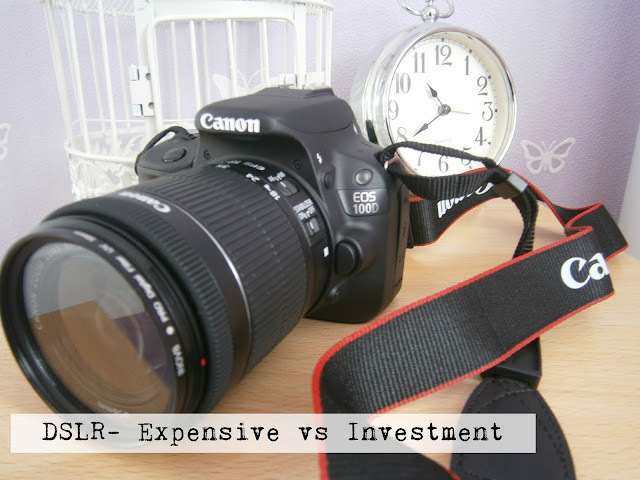 Are you buying a DSLR to try and make you work harder at your blog? Are you buying it because you think it will make you look better and more professional? or do you want a DSLR because your committed to your work? A good camera, with a better sensor, more megapixels and bigger zoom is sure going to give you a leg up in the right direction but it also goes hand in hand with a good composition.lighting and background. Learning is not just something you do one afternoon and that's it, your sorted for life- its an ongoing process, you learn by trail and error. If your not prepared to do this, it is not a investment, more a great dust collector. If your not prepared to look after your camera, your find yourself back at the camera shop before you can say ' DSLR' You don't have to wrap it up in cotton wool, they are made to withstand their fair share of bumps and bruises, but still- look after it. What I'm trying to get across is the fact that, if you blog, every now and again and you are considering buying a DSLR, its probably not going to be worth it, you won't invest your money wisely, you have to be really passionate about your blog, for a DSLR camera to really be an investment. I think a DSLR is a good investment if you are willing to learn how to take really good photos with it, and are be going to se it or the foreseeable future - if not it's definitely not worth getting one! Exactly! If your not willing to learn why bother buying one! I think if you're going to make such a big purchase on an item which, for many, will be used for just a hobby, then you should definitely learn how to use it properly and well:) The amount of people I've seen with DSLR's who wear them around their necks all day and then use them purely for mirror selfies is unreal! I would love to get a DSLR, but I currently have a perfectly functional camera which I use for my blog. :) I would use it often, but it is quite the investment for a student. I would definitely wait a while before I decide. I have a DSLR camera, and I'm so glad I purchased it! I actually didn't even have a blog when I got one and didn't do much with it (I literally worked most days and wouldn't spend my money on anything at the time, so it was still nice to treat myself to something), but since then I've been learning more and more about it. It's come in handy with my blog, and I love figuring out what all of the features do. Also, personally I enjoy having a DSLR camera. I had a cheap little digital camera when I was a kid, and I took pictures ALL the time. Looking back, I'm so glad that I did, because I got to get pictures of all the good times I had as a kid with all of the people I care about. I'm hoping to get more photo happy again so that I can look back on my photos and remember all of the great experiences I've had and all of the people I was with. I'd love to buy a DSLR camera but at the moment I feel like I am only just starting to properly get into my blog. I feel if I bought one and gave up on my blog (which I don't plan on doing!) it may be a waste of money. Sure I could use it for other things like capturing memories or simply for photography but I think I'm going to wait a bit until I invest in a camera so expensive! Great post, good to see someone talking about cameras and if they're worth it. I'm considering a camera to up my quality but I just find DSLR's to be so expensive! I reckon I'll end up with an Olympus but this is definitely food for thought! I love talking about cameras! I definitely recommend buying an Olympus, they are a really good brand! I 100% understand where you are coming from, they are very expensive but there are other great alternatives out there!